I've updated this post with a different paper napkin. 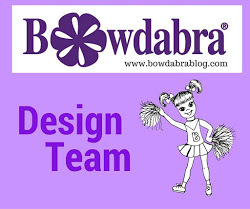 I'm always looking around on different retail sites to get ideas on crafts to make. For Easter and spring, I discovered the cutest decoupage bunnies on Grandinroad and knew my next project would be inspired by these. 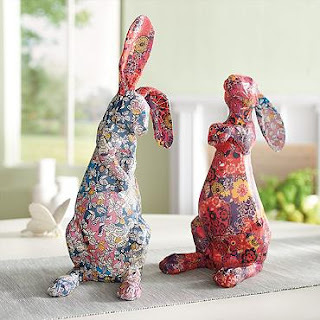 The only problem - well, one of the problems I had was trying to find paper mache bunnies as large as these to decoupage. No such luck, so I had to make my own. And, I had intended to make two, but this project became so tedious and time consuming that I was happy when I finish the one! To begin, I used a 2.1qt. soda bottle that I cut off the top opening. I would discover another problem in finding paper napkins I wanted to use - something springy and hopefully in purple - but that wasn't to be either. Although, I did find a flowery purple pattern at Party City online but didn't want to wait another week or more for them to arrive. So after looking in several stores, I settled on a design I found at Tuesday Morning. 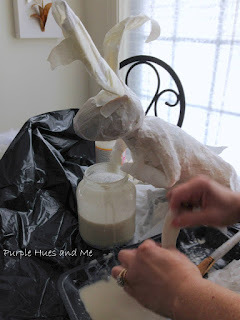 Next, I added small rocks in the bottom of the bottle to give weight to the bunny and also stuffed the cavity with plastic bags so the sides would not cave in like they did when I washed the bottle. With a picture of the bunnies to look at, I began shaping the structure with masking tape, using a paper mache egg for the head (wrapped in a plastic bag), and clothes hanger wire for the ears. I also used a portion of a toilet paper tube to extend the neck. And used folded paper towels to shape the bunny legs and feet. And also used them to increase the bottom area of the bunny . . .
and to cover the ears. The masking tape that I used to secure the paper towels was rather old and kept coming loose. But it was snowing outside so going after new tape was not an option for me. Once I was satisfied with the bunny's shape and foundation, I mixed up a paper mache paste - one part water, one part flour and a pinch of salt. I had a large roll of white drawing paper that I torn up in small strips and started gluing them on to the frame. After I finished gluing on the first layer, I placed the bunny in the oven set on 200 degrees to dry. Laying the bunny down in the oven flatten the backside so I didn't put it back in the oven anymore. After that, I added two more layers using a blow dryer first and then letting it air dry overnight each time. After drying, I added a coat of mod podge to seal the entire structure. To decoupage the bunny, begin by removing the two layers of backing of the napkin to expose the single printed side. Tear out the portion of pattern you want to use making sure there are no hard lines or straight edges. 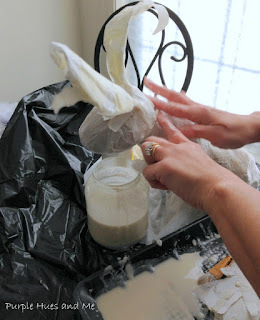 Using a sponge brush, apply mod podge to the paper mache area and then lay the napkin piece on top, smoothing it out with the brush. I also like to use plastic wrap to gently smooth out any additional wrinkles. Continue applying the napkins in this manner, slightly overlapping each piece as you continue to cover the bunny. Allow to dry once the bunny is completely covered with the napkins. And finally, seal the dried bunny with a brush on clear varnish or sealant. I am really excited about how amazing this bunny looks. *But wait! I found a purple print paper napkin that goes more with my décor! So, I covered the bunny with a white primer paint. And then decoupage on the new napkins the same as before! Doesn't this look so much better! And I added a bow! Oh, I'm loving this look! Wow, cool bunny:) I always end up with lots of plastic soda bottles and just tossed them out into the recycle bin. I wish you were my neighbor so I could give them to you to make more of these cool bunnies. Oh Gail! You're so creative. I love your bunny...so sweet! I hope by the time you decide to make a companion, you can find some pretty purple napkins to use ( wouldn't violets be adorable?). Stay warm...it's definitely not Winter here. I think it forgot us this year. Gail you never cease to amaze me! That turned out fantastic! What a fantastic tutorial Gail and a FABULOUS BUNNY creation! I don't know if I have the patience for this, but I'd love to try! It's just adorable! Thank you for the inspire! Goodness Gail, aren't you the clever one? That is fantastic. I did see those bunnies on Grandin Road. Love it! so super cute! love this bunny and thanks for the tute! This little bunny (or other creature) would be fun to decorate a nursery/play room too. Just don't let the kids get it! Gail, you are one inspiring, clever, artsy gal. I'm going to give this one a try for sure. So. Adorable!!! Wow that looks like a lot of work but your bunny is amazing. I don't know how much the originals were but I'm sure you saved a LOT of money doing the bunny yourself. Thanks for showing us how we can make one too! Oh my goodness!!! At first, I thought you had decoupaged a store bought rabbit. But no!!! You made your own. Amazing!!! Thanks for sharing it on the Table It link party! This is so imaginative and fun! Perfect for an Easter craft with my girls! This is amazing!!! When I first saw the picture I thought it was a bought one. You are so talented!! Oh my, your decoupaged bunny is amazing. How clever of you to make your own. Thank you for the 'how to'. Your bunny is so, so cool! Oh wow! It's so cool seeing how you made this bunny! You did an amazing job! That is amazing! I loved seeing how you made the actual bunny. Pinned it! Wow that is fantastic, you did such a wonderful job creating the bunny from that bottle and egg for the head, love the napkins you settled on it is beautiful! Gail, I so adore your bunny and am featuring it this weekend at the DIY Sunday Showcase Party! Amazing that you made the bunny from scratch! I'm totally blown away. Gail,, you are a true artist. You have created something so special and beautiful from practically nothing. I am in awe of your talent. This bunny is adorable. I love that you have built him all from scratch! I noticed in your first photo they lovely mirrored wreath on your wall. So pretty, where did you find it? Wishing you a great weekend. What an awesome project. The bunny is adorable. What a work of art! Thanks so much for sharing with us at Merry Monday. Dearest Gail, your rabbit is amazing! I can't believe what you made it out of...the finished look is so sweet and something you would find in a store. Wow! I am incredible impressed! I thought for sure when I saw the photo that you decoupaged a store bought bunny! It's amazing! Amazing, Gail!!! You are truly talented. Thank you for sharing your bunny with us at Homemade and Handcrafted. 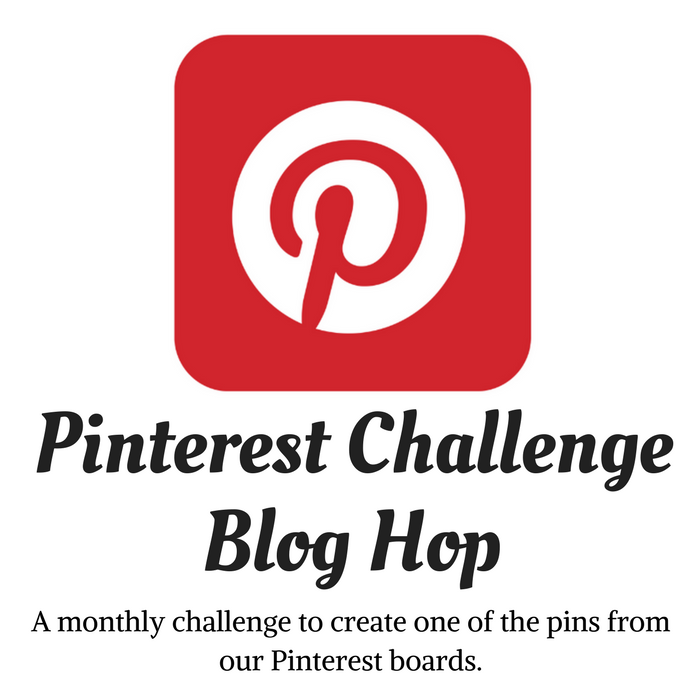 Pinned to share too! Oh yes, it definitely looks better! I think the purple shows better. Maybe it's not as busy as the other print. Or maybe it's because it's purple! :-) I really do like the purple better than the other print. 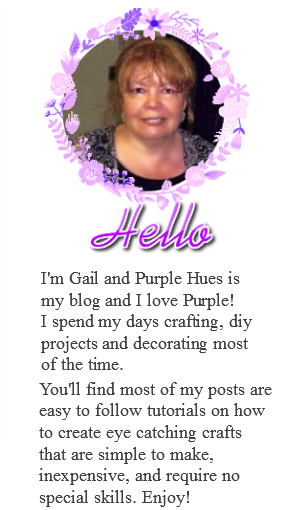 This is so awesome Gail, I absolutely love it! Your bunny pose is fabulous!! and love the all over decoupaged pattern!! Adorable!! Gail, This is absolutely fabulous!! Thanks so much for sharing in detail, the entire process. Pinning! Your bunny is so darn cute. Love him in purple. I am going to try this during the summer for next year. When I raise my arms my hands go numb so I do mnot want to do him for this year. Love the new look! You are so dang talented! Your bunny is absolutely fabulous! I am amazed at how you were able to recreate the bunny out of a plastic bottle, a hanger and paper towels! It is adorable. I see why you only made one. It makes it all the more special. This is so cute! I can see one of these in my future! I love the purple on the bunny! Such a great craft. I'm pinning this amazing bunny! Oh my gosh you built that bunny! What a great step by step tutorial. Thanks for sharing with Creatively Crafty Easter Link Party.